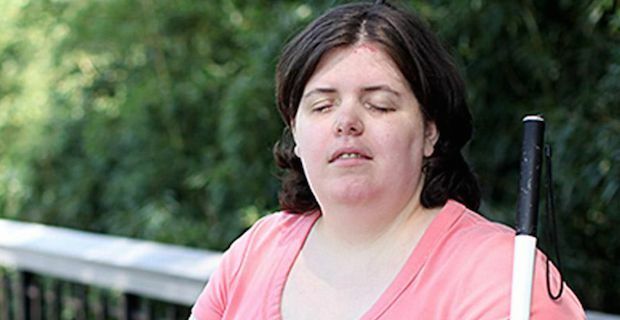 Ever since Jewel Shuping from North Carolina was a child, she has always wanted to become blind. At the age of 6 she said that thinking about being blind made her feel comfortable. Her mom warned her not to look directly at the sun as it damages the eyes, so that is exactly what she would do. As a teenager she got thick black glasses, by 18 had her first white cane and by 20 was completely fluent in Braille. She was pretending to be blind. The 30-year old suffers from Body Integrity Identity Disorder, BIID, which is when able bodied people believe they are meant to be disabled. Those who suffer from this often have the desire to amputate one or more healthy limbs, but Ms. Shuping wanted to be blind. She eventually found a sympathetic psychologist in 2006 who started putting eye drops of drain cleaner in her eyes. Prior to that she bought numbing eye drops in Canada which were put in before the cleaner. It took a total of 6 months to become fully blind. Her left eye suffered a 'corneal meltdown', collapsing in on itself and requiring the eye to be removed, while her right eye had glaucoma and cataracts and a webbing of scars.The psychologist may be facing prosecution.